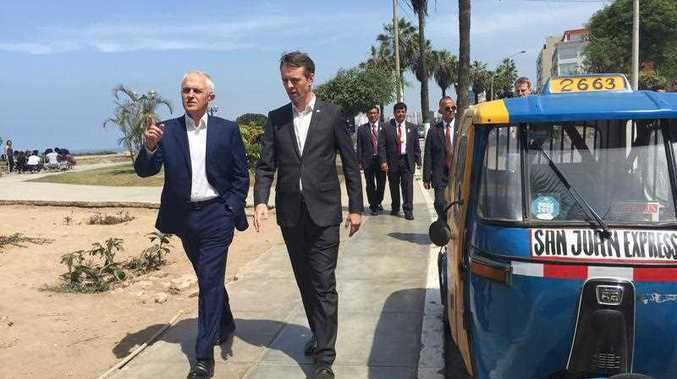 PRIME Minister Malcolm Turnbull has arrived at this year's APEC Summit in Peru and spruiked open economies and free trade and against a drift towards protectionism in western economies. Mr Turnbull warned that "protectionism is the way to poverty" - which was demonstrated in the Great Depression. However, Mr Turnbull has chosen not to directly criticise those like US President-elect Donald Trump, who has talked about slapping tariffs and taxes on imports. "What he has said is he wants America to have better trade deals. Well he is entitled to argue for that," Mr Turnbull said. Mr Turnbull tried but failed to secure a meeting with Mr Trump on his way to the summit in Lima.